Walk down Paseo de la Reforma in Mexico City and you’ll find yourself indulged with architecturally modern buildings with colonial charm you can also find many museums, arts and craft street venders, and monuments that represents deep-seated stories of Mexico. In the heart of it all there’s Mexican street food that paints the avenues with flavorful aromas of antojitos. Antojitos or street food in Mexico, ecompasses a major role in the rich Mexican culture honing their title as having the best street foods in the world. Below a few cuisines you can find in the bustling streets of Mexico. Tamales is a popular street food in Mexico , this corn based meal dates back to the ancient Maya era. Its made from masa a corn based dough mix with shortening, it’s usually wrapped with plantain leaves. 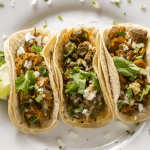 The fillings vary from shredded pork to chicken and you can usually find street vendors selling them along with salsa verde or a popular Mexican sauce called mole. 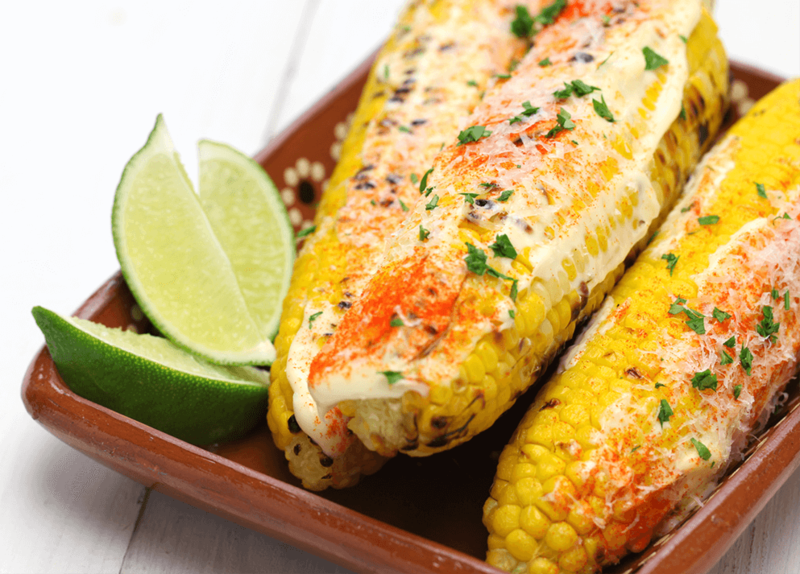 This classic Mexican street food dish is simply grilled white corn on the cob usually with the husks, with mayonnaise, sour cream, butter lime and chili powder. Its served with on a stick making it a suitable street food. These small tacos is a Mexican staple when it comes to cuisine. The tortilla is tightly rolled with either seasoned beef, pork or chicken then deep fried to mouthwatering perfection. Although this dish is simple to make, what sets it apart from other taquitos are the sauces. Some vendor serves them with sour cream and gaucamole with a special mole sauce. Patita de pollo or chicken feet is a delicacy in Mexico. You can find them in stews or soups for a hearty traditional Mexican meal or you can see them breaded and fried. Mexican empanadas is a staple food in the streets of Mexico. They’re made from wheat or corn based dough fried and filled with either a sweet filling like yams or sweet potatos or meats and cheese. Empanadas can be served for breakfast, or lunch or snacks. Another street food staple in the Mexico is Tostada. Is made from a deep fried tortilla then topped with seafood or stews. If you ever plan to go to Mexico City , make sure to try one the many street foods the city has to offer, your piqued taste buds will thank you!